Essex based manufacturer of the popular range of AP ProSeries have reported a boom in sales of their high performance range of AP ProSeries torches, in response to bad weather warnings and the threat of possible power cuts. The demand for our torches has risen significantly in the wake of winter weather warnings, and expected blackouts. The latest weather reports are suggesting that the UK ought to be braced for arctic weather with freezing winds from the north set to batter the country, and a drop to arctic sub-zero temperatures expected next week. As a consequence, it has been reported by the National Grid that Britain is also at risk of powercuts this winter, due to an increased demand for electricity. Indeed, a repeat of October’s bad weather, when UK Power Networks reported 140,000 homes were without power in southern counties as a result of storm-force winds and floods, could be on the cards. With blackouts anticipated as a result of the expected turbulent weather, being in possession of dependable battery-powered lighting may become necessary for the home and outside when Britain’s winter woes hit. One man who would entirely agree with that view is Ted McLoughlin, Sales Director at Active Products, the manufacturers of high performance torches and spotlights. 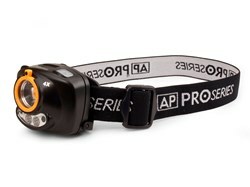 On Active Products’ latest range, the AP ProSeries, McLoughlin comments “The demand for our torches has risen significantly in the wake of winter weather warnings, and expected blackouts. Certainly, all the emergency services are emphasising the need for quality dependable torches to be kept in the car in case of emergencies, while, it’s a good idea to have one on hand when you leave the house. Aimed at both the professional tradesman and the consumer market, the Active Products ProSeries range of torches uses the latest innovative Cree Technology LED bulbs to emit extremely powerful and bright beams of white light. The impressive Cree bulb is capable of pumping out double the light of a standard LED bulb, while running for 50,000 hours longer. The ProSeries range spans from small hand-held torches such as the 75 lumens, to powerful spotlights that can beam distances of up to 300 metres, while the ProSeries head-torch, activated by motion sensor technology, is ideal for any hands-free activities. All torches in the range offer substantial durability, energy-efficiency and incredible beam capability. The full range of AP ProSeries high performance torches are backed by a three year guarantee. Visit Active Products’ new ProSeries website here to discover the full AP ProSeries range today.